Two weeks ago, New York Times restaurant critic and noted Señor Frogs fan Pete Wells ripped apart one of New York's most expensive fine-dining establishments, Per Se, in a two-star review that likened a "lukewarm matsutake mushroom bouillon" to bong water. 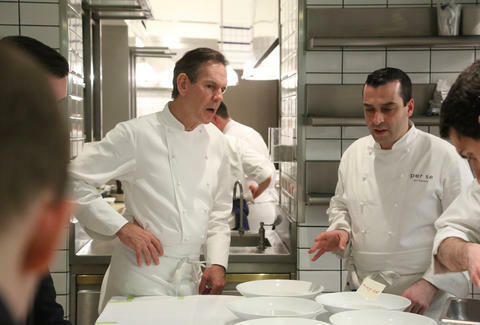 Yesterday, Per Se's owner and chef, Thomas Keller, responded to the review in a public Facebook post. But instead of firing back at Wells and the Times, as Altamarea Group did after Wells' negative review of Vaucluse, Keller owned up to Per Se making mistakes and not meeting its own very high standards, and promised to "work even harder" to "deliver a most memorable experience." — Thomas Keller, Chef / Proprietor"
Grub Street notes that last night's tasting menu already showed price drops (though this in no way means you can now afford a dinner at Per Se). Lucy Meilus is Thrillist's New York Editor and would like a Pete Wells review of her life. Follow her on Twitter and Instagram.